You’ve boarded a flight and you’re feeling pretty relaxed sitting in that big comfy first class seat. Sucka, you think to yourself as a couple of passengers check you out on their way to coach. Glancing at your watch, you wonder where the heck the flight attendant is because you’re dying of thirst and shouldn’t she be offering drinks right about now! Predepartures. That’s what flight attendants call the drinks that are served before takeoff to passengers seated in business and first class. If there’s time flight attendants will walk through the aisle and take individual orders, but time is the key word here. With so many full flights staffed with minimum crew, there’s usually not enough time to check the emergency equipment, set up the galley, hang all the coats, get passengers situated AND serve predeparture beverages. This is why flight attendants might choose to do a one shot service and offer passengers Champagne (if we have it), orange juice, and water- or nothing at all. Because it’s more important to get flights out on time than it is to serve drinks before takeoff. What most passengers don’t realize is that it’s against FAA regulations for an agent to shut an aircraft door until all the overhead bins have been closed. If the agent can’t close the aircraft door on time, the flight will be delayed. If the flight is delayed (even by a few minutes) someone will have to take the blame. This means someone will get written up. If an airline employee is written up too many times for causing a delayed departure they might very well lose their job. On time departures are a big deal in the airline industry. So that gin and tonic the passenger in 3A is crying about is not a concern if passenger 23D refuses to sit down and passenger 14E can’t get her suitcase inside an overhead bin and the flight attendant working in the back is calling up front to let someone know there are seven bags on their way up that need to be checked. 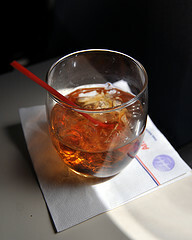 Here are a few other reasons flight attendants might not serve you a drink before takeoff…. You could write a book about what people don’t know. Oh wait – you are! Your airline should sponsor your book to be be placed in every front pocket so that everyone could read it and know these bits of information. I think a lot of passengers get irrate (sp?) because they don’t know what’s going on – like this info about drinks. Better yet, have your most Elite status flyers get a copy of your book in their flight kit. Just a thought. When does your book come out? Oh, and also, check out my new avatar! You may not remember but you posted my pic on your lavator page. I was holding up my old headshot. The avatar you see is one of my new ones!